Today I spent many hours recording, editing, and uploading tutorial videos that show how to create a coil basket using recycled grocery bags. This is a beloved final project for my sixth graders every year, and they were eager to work on their coil baskets from home, but wanted to have the instructions available on video in case they had trouble working independently. I set up my flip mino on a mini tripod but i really need something taller so that I can film over my own shoulder- the mini tripod has to be located so close to my hands that it can never really focus completely. At any rate, in the past my students have only had xeroxed handouts that showed hand-drawn pictures of the coil basket weaving process, so this is a dramatic improvement, and the videos could potentially be played by my substitute as a review while I am at a day-long meeting on Thursday. The tutorial is broken down into brief segment to allow student to select the specific step they are having trouble with. I have seen many coil basket ideas that involved recycled materials, my favorite being the Spiral Foundation, but this picture tutorial from Clever Nesting helped me the most. I used to spend tons of money from my budget purchasing coil rope core for this project, and now Our coiling core is free AND earth friendly! I’m refraining from adding “of doom” to the title of this post, but know that I REALLY thought about it. 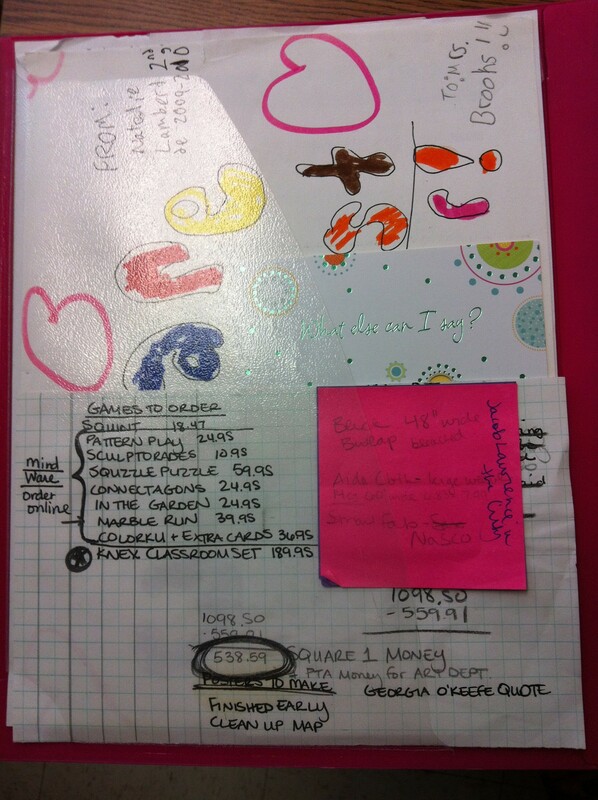 When I started teaching, it was hard for me to figure out how to organize the information in my planner. I was unsure what I needed to include or how to arrange everything in a useful way. Over the past couple of years I have found a system that works for me, and I thought I would share it here. This is not the only way to organize a lesson planbook, but it is one way, and if you are a brand new teacher this might help you figure out some of the ingredients to help you get started. First- the book itself: I chose a 2 1/2 inch 3-ring binder. I almost need a 3 inch- but I have decided that would be going overboard. As you can see 2 1/2 inches just barely contains everything I include. Inspiration/Motivation: I think it is essential to have inspirational artwork included at the very front of the planner, in times of great trial and tribulation, I like to imagine I am in the artwork below- happily raising my arms in the air with triumph while I relax at the beach. Quick View Items: In the front pocket of my binder I include a few more inspirational items- thank you notes from my students. I also use this pocket to store my art room wish list, in case anyone decides to give me some money to spend on my art room. 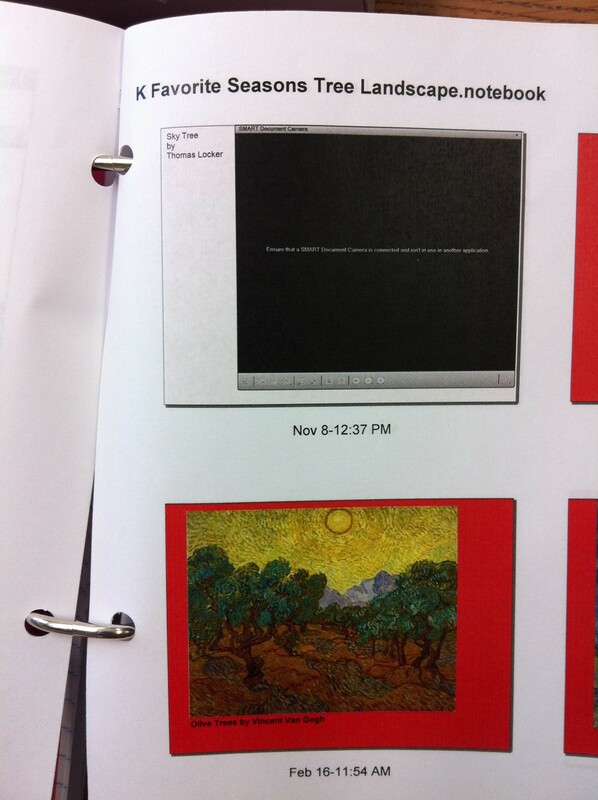 Important Files & Folders: Next I like to include the folders that I need access to throughout the year. 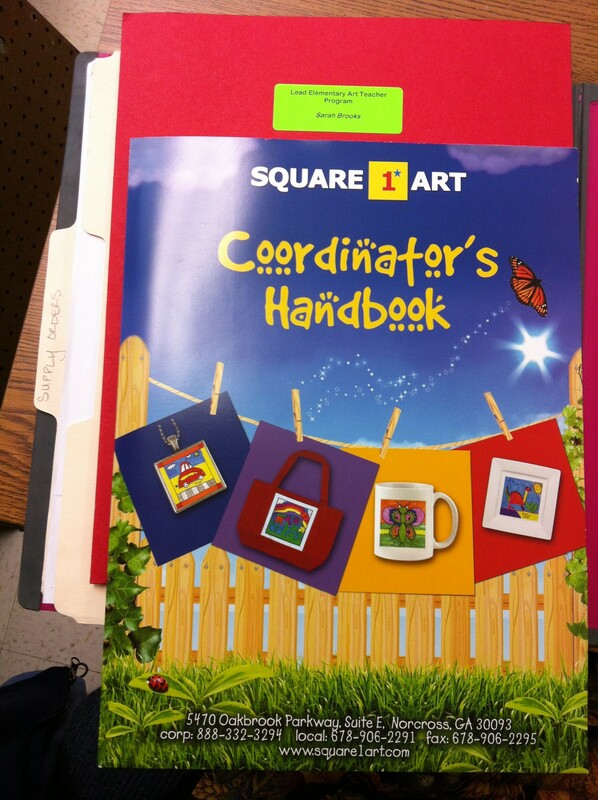 I used to keep these in my filing cabinet, but I found that I use them so frequently that it is more useful to have them included in my planner- here I have my supply order file, my lead elementary art teacher folder and my square 1 art fundraiser folder. 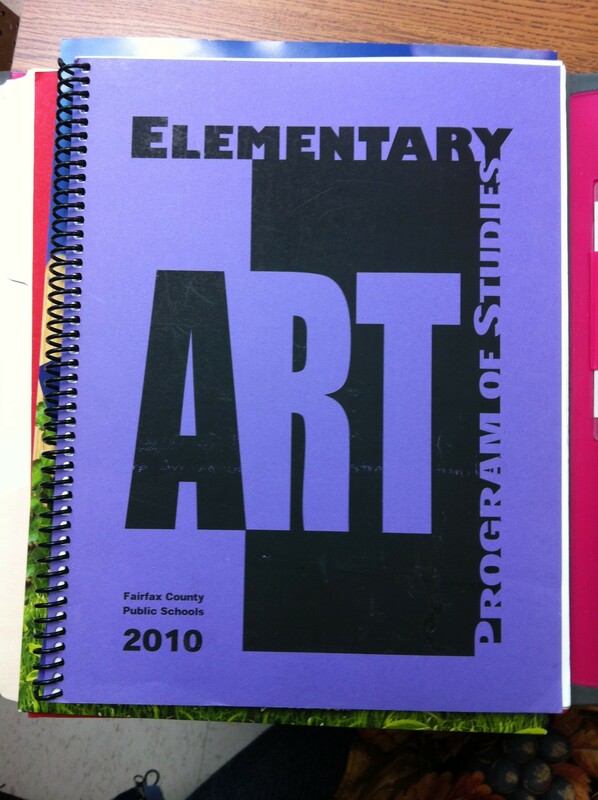 The Art Teacher Bible AKA Program of Studies: Also tucked into the front of my planner is the spiral bound copy of our county’s elementary art program of studies. Whenever I am developing a new lesson plan I like to check the good word just to make sure I am not forgetting anything important. Weekly Planning Calendar: After that I have a section for my weekly plans, which helps me stay organized for the week. I can see my entire week at a glance, which helps me figure out what materials and display items to prep and when. I try to highlight anything that is not a typical weekly item using a bright color or a bubble. I also put anything I need to be thinking about that week on a boldly colored post it note in the upper corner of my weekly plans. 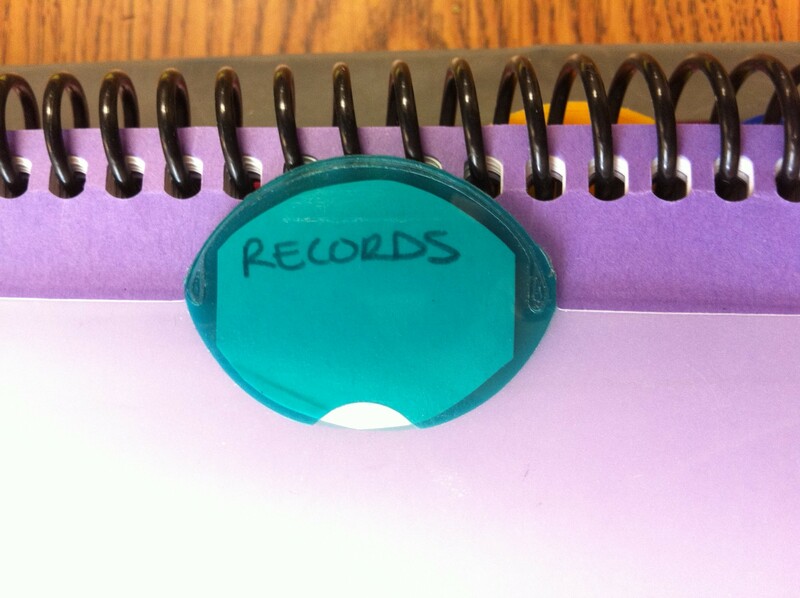 Records- Documentation: Next I include a section for any written records such as anecdotal notes about classroom participation or behavior- it is really important to keep these notes on hand, in case of parent conference meetings or questions from the general classroom teacher. Grade Level Lesson Plans: After that I have each grade level separated by a tab. Behind each grade level divider tab are the detailed lesson plans that are currently being covered or will be covered within the next month. My theory on how many lesson plans to include is based on the following imagined scenario: If I was in a tragic accident/had an emergency operation/was kidnapped by aliens what would the emergency long term substitute need to attempt to do my job? I decided that one month of prepwork and my weekly lesson plans would get the sub started- after that they are on their own. Here you can see that my detailed lesson plans contain the lesson plan iteself, any notes about materials or possible changes to the typed plan, as well as printed copies of handouts and the powerpoint or smart notebook file I would use to present the lesson. I have digital copies of all of this information stored and updated in my Dropbox so that I can access it at work or at home on my laptop, as well as from my iphone in case I am ever sick or stranded somewhere. This makes it easy for my to prepare for any last minute subs- except in the case of alien kidnapping or tragic accident- I doubt I would have my phone handy in either of those situations. Lesson Plan Crate: All other printed info is stored on separate binders by grade level in a crate on the counter beside my desk. When I need to update my planner I take out the lesson we just completed, store them in the binder on the counter and take out the next lesson. This way it is easy for my to keep my plans up to date, and I only have to print lessons if I am doing something new or if a lesson plan changes dramatically. 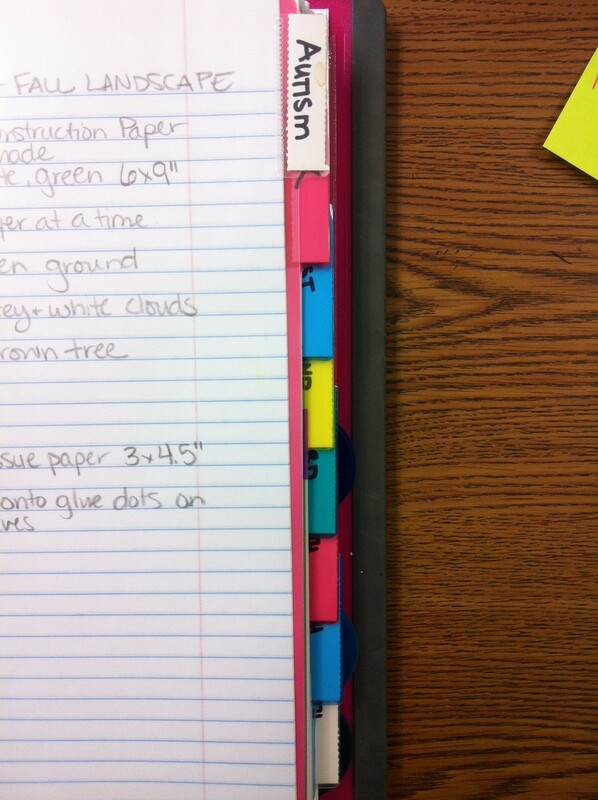 Post-It Note Planner: The last detail of how I organize my planner is more of a tip- not really included in the binder itself. I- like most art teachers- teach many different grade levels and many different lessons. In order to make sure I dont forget anything important, I try to distill the essential steps of my lesson into one post-it note worth of info. I stick the post-its for the days lesson onto my laptop where I can see them while I am teaching. This saves me running back to my desk to reread a lesson if I forget something in the moment. Here you can see the first day of my kindergaten landscape painting lesson distilled into one post-it note. I started doing this as a student teacher and it really helps me stay on track. I try to keep the post it notes stuck with the original detailed lesson plans, but it is easy to make a new one if the post it gets lost. Hopefully this will be helpful for someone as they prepare for teaching art. No one ever showed me this before I started student teaching, and it even helped one of my coworkers with getting organized, so I think it is valuable information. Happy planning!